Did you know that a few percent of all stars are traveling alone through intergalactic space, no longer a part of any galaxy? Gravitational interactions between stars or between stars and black holes can occasionally accelerate a star to galactic escape velocity so that it is thrown (eventually) into intergalactic space. When the star first enters intergalactic space, the view of your home galaxy would be pretty remarkable, but eventually (eons later, of course) there would be very few naked eye objects in your night sky. Just moons and planets, meteors, aurora, comets, the zodiacal light, and maybe a galaxy or two. Anything else would require a telescope. And an observer, of course. The first evidence for intergalactic stars came from the detection of diffuse light between galaxies (Zwicky 1952). Much later, intergalactic planetary nebulae were detected in the Fornax galaxy cluster (Theuns & Warren 1997). More recently, intergalactic red giant stars have been detected in the Virgo galaxy cluster using the Hubble Space Telescope (Ferguson et al. 1998). The Fornax cluster lies about 62 million light years distant, and the Virgo cluster 54 million light years distant. Have any intergalactic stars been detected near our Milky Way galaxy? Brown et al. (2005) discovered the first hypervelocity star, SDSS J090745.0+024507, a 20th-magnitude star in the constellation Hydra. Though it is just 160,000 light years from the center of our galaxy, it is moving away from the Galactic center at an astonishing radial velocity of 709 km/s. Even though this one-dimensional radial velocity1 is only a lower limit to the star’s true 3D space motion, it is far and away fast enough to escape our Milky Way galaxy altogether. Gaia will probably be able to measure this runaway star’s proper motion in right ascension and declination, thus allowing a determination of the true space velocity of SDSS J090745.0+024507 relative to the Galactic center. Several more hypervelocity stars have been discovered since 2005. One of them, US 708, a 19th-magnitude white dwarf in Ursa Major, is exiting our galaxy at a velocity of at least 1200 km/s! This makes it the fastest on record (Geier et al. 2015). 1The observed one-dimensional radial velocity as seen from Earth is corrected for the Earth’s rotation and motion around the Sun, and the Sun’s motion around the center of the Milky Way galaxy to determine the galactocentric radial velocity. It is hard to believe that Carl Sagan has been gone now for 20 years. In fact, he died on this day in 1996 of myelodysplastic syndrome at the age of 62. He was one of the 20th century’s truly great science popularizers. In addition to writing or co-writing fifteen books, his 1980 PBS television series Cosmos remains the gold standard against which all other astronomy documentaries will be judged. Carl Sagan’s final interview was with Charlie Rose on May 27, 1996, less than seven months before his death. You can see it here. Carl’s daughter, Sasha Sagan, wrote a loving and thoughtful essay in 2014, the 80th anniversary year of his birth. Here, now, are just a few of Carl Sagan’s most memorable quotes. One of the criteria for national leadership should be a talent for understanding, encouraging, and making constructive use of vigorous criticism. We’ve arranged a global civilization in which the most crucial elements — transportation, communications, and all other industries; agriculture, medicine, education, entertainment, protecting the environment; and even the key democratic institution of voting, profoundly depend on science and technology. We have also arranged things so that almost no one understands science and technology. This is a prescription for disaster. We might get away with it for a while, but sooner or later this combustible mixture of ignorance and power is going to blow up in our faces. Humans may crave absolute certainty; they may aspire to it; they may pretend, as partisans of certain religions do, to have attained it. But the history of science — by far the most successful claim to knowledge accessible to humans — teaches that the most we can hope for is successive improvement in our understanding, learning from our mistakes, an asymptotic approach to the Universe, but with the proviso that absolute certainty will always elude us. The Cosmos is all that is or ever was or ever will be. Our feeblest contemplations of the Cosmos stir us—there is a tingling in the spine, a catch in the voice, a faint sensation, as if a distant memory, of falling from a height. We know we are approaching the greatest of mysteries. I’ll wager that most of you over 50 years of age grew up on a street with sidewalks on both sides of the street and all the way around the block. You probably made use of them often. Sidewalks used to be essential in residential neighborhoods. Today, not so much. More often then not, newer residential subdivisions do not have sidewalks, nor do they have off-road walking trails meandering through them. If you walk at all, you have to walk in the street. Having motorized vehicles and pedestrians sharing the same space is inherently risky, especially at night. It is interesting to note that the Ancient Romans built sidewalks everywhere, but by the Middle Ages, people were again walking in the streets. Progress is not inevitable. Today, developers generally consider sidewalks to be an unnecessary expense, and homeowners are not clamoring for them because they are usually saddled with the expense of keeping them up. Therein lies the problem. It is my view that sidewalks should be treated as public infrastructure no different than city streets. Just as the developer pays most or all of the cost of building the streets in a new residential subdivision, they, too, should be required to build sidewalks or, in a more rural subdivision, walking trails. Sidewalks should be maintained (and that includes snow removal) by local government supported by tax revenues, not directly by the homeowner. Perhaps the typical homeowner might be more supportive of sidewalks if they didn’t have to shovel the sidewalk in front of their house each time it snows, or replace sidewalk slabs when they’re broken or cracked. Sure, they’d still be paying taxes to support those activities, but it would be a win-win situation for the entire community. And shouldn’t that be our goal—the common good? My all-time favorite planetarium software program is Voyager 4.5 from Carina Software. Hardly a day goes by when I am not using it, and my use of Voyager goes all the way back to 1993. The current version for Mac OS X (and Windows) is 4.5.7. Sadly, the last update was in 2010. I wish there was something we could do to ensure that Voyager will be maintained and enhanced in the future. Speaking of maintenance, in 2015 Voyager ceased being able to import comet and asteroid orbital elements through its automatic Updates process. This happened because the URL changed for both. Seems like a pretty easy fix to me. If Carina won’t fix it, then maybe someone can edit the executable and change the two URLs? Fortunately, you can still manually import these orbital elements by following these instructions. Navigate your web browser to https://www.minorplanetcenter.net/iau/Ephemerides/Comets/Soft00Cmt.txt and save this page to a file, which will automatically be called Soft00cmt.txt. You can save it anywhere, but I’d suggest you save it in the Import Files folder in the Voyager 4.5 main directory within your Applications folder. Navigate to Applications : Voyager 4.5 : Import Files : Soft00Cmt.txt and click Open. You will get a message box asking “Before importing new data, do you want to delete all current asteroid/comet/satellite data?” Click Yes. Next you will see an Import results box showing you the number of comets added to Voyager’s database. Click OK.
Navigate your web browser to https://www.minorplanetcenter.net/iau/MPCORB.html and under Available Files right click on MPCORB.DAT (uncompressed) and Save Link As… to your Voyager 4.5 Import Files folder. Do not open this file in your web browser as it is over 147 Mb in size! The file saved is called MPCORB.DAT. Navigate to Applications : Voyager 4.5 : Import Files : MPCORB.DAT and edit the MPCORB.DAT file with the editor of your choice. Remove the header lines at the top of the file right down through the line of dashes, and save the file. Navigate to Applications : Voyager 4.5 : Import Files : MPCORB.DAT and click Open. You will get a message box asking “Before importing new data, do you want to delete all current asteroid/comet/satellite data?” Click Yes. It will take a while to import all the asteroids, and then you will see an Import results box showing you the number of asteroids (and transNeptunian objects, by the way) added to Voyager’s database. Click OK. Whether you have a portable or observatory-mounted equatorial telescope, accurate polar alignment is a must if you plan to do any long-exposure photography. Here’s one basic procedure you can use. If you have a fork-mounted Schmidt-Cassegrain telescope, you can begin your polar alignment process during the day. First, using a bubble level, make sure your telescope base is completely level. Next, adjust the equatorial wedge so that it is set to the latitude of your observing location. Then, point the telescope at the zenith and adjust both the right ascension and declination motions until a bubble level atop the telescope end cap reads completely level. Then set your declination setting circle so that the declination reads the same number as the latitude of your observing location. As soon as it is dark enough to see a star, align your finderscope and main scope so that the star is at the center of both fields. When it is dark enough to see Polaris, set your telescope’s declination to 90° and adjust the azimuth of the equatorial wedge until Polaris is as near as possible to the center of the finderscope’s field of view. With your unaided eyes, note the location of the 2nd brightest star in the Little Dipper, Kochab, relative to Polaris. 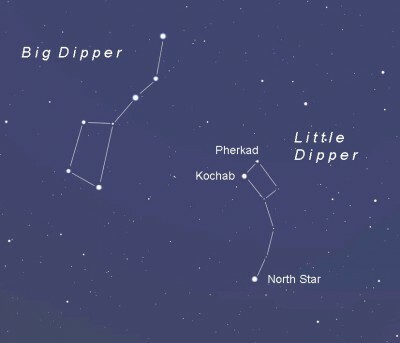 Kochab is the bowl star at the opposite end from Polaris that is closest to the bowl of the Big Dipper. Presently, the North Celestial Pole is located 40 arcminutes (⅔ degree = about one-and-a-quarter moon-widths) away from Polaris in the direction of Kochab. Adjust the altitude and azimuth of the equatorial wedge so that the center of the finder field is located ⅔° from Polaris in the direction of Kochab. This may be quite difficult, so just do the best you can. Now, pick a star on or very near the celestial meridian and the celestial equator (declination 0°). Center the star in the main scope and make sure the clock drive is on. If the star drifts south, make a slight adjustment to the equatorial wedge towards the west (counterclockwise). If the star drifts north, make a slight adjustment to the equatorial wedge towards the east (clockwise). Ignore any east-west drift. Keep making adjustments until you have eliminated all drift. Now, pick another equatorial star on the meridian and repeat the procedure outlined in the two paragraphs above until no more adjustments are needed. Your telescope is now precisely polar aligned. Expanded polystyrene (C8H8)n, known as EPS or styrofoam, consists of up to 98% air by volume, making it a great packaging material. However, it is more difficult to recycle than other plastics and is also bad for the environment (floating in the oceans and ingested by marine animals, for example). Expanded polystyrene in the form of packing “peanuts” and molded shapes has one very undesirable property for the end user: static electricity. When you open a box with this material, the packing peanuts and detritus formed when you break larger pieces for disposal have a strong tendency to draw electrons away from other materials—even the air. This results in a net negative charge, and EPS, being an insulator, ensures the excess charge remains localized and does not easily dissipate. The result is that the EPS particles and peanuts stick to just about everything. They also repel each other which often becomes a point of frustration when you try to corral the plastic peanuts in a garbage bag. Fortunately, there is another option that is better for the environment and does not suffer from static electricity: starch-based packing materials made from corn or other plant materials. You have undoubtedly come across cornstarch packing peanuts and maybe even noticed that they dissolve easily in water. But did you know this material can also be shaped into molded forms and sheets? I’d like to see “styrofoam” packaging materials completely replaced by starch-based alternatives. Though currently these bio-derived materials are a little heavier than EPS and cost a little more to manufacture, with increased utilization and further research & development these current challenges can be overcome. The next time you receive a package in the mail (or purchase an item at the store) from a manufacturer or a distributor that uses EPS materials, why not write them and ask them to use starch-based packaging materials instead? And, be sure to thank manufacturers and distributors that are already using starch-based packaging materials. As consumers, we have a responsibility to “move the needle” towards a more sustainable future for humanity on planet Earth. Many times each week, all manner of asteroids and trans-Neptunian objects pass in front of stars, casting shadows a few miles wide all over the Earth. There are several potential events each week at any particular location. I use the word “potential” because there is still significant uncertainty in the paths for many of these events. The orbits of most small solar system objects are not yet precisely known, and, to a lesser extent, there is some uncertainty in the position of the occulted (obscured) star. On Sunday evening, November 20, I got lucky. Not only did I record a 1.02 second occultation event, but I was lucky to see it at all as I was significantly south of the predicted path. The star affected was Tycho 5182-758-1 (also known as BD -3° 5037) in Aquarius and the object that moved in front of it was the asteroid 430 Hybris, a space rock about 20 miles across that orbits once around the Sun every 4.8 years. Many asteroids have interesting names, and Hybris is no exception. In Greek mythology, Hybris is a spirit of insolence, violence, and outrageous behavior. It is also an alternative form of the word hubris. All quite appropriate given the outcome of the U.S. presidential election less than two weeks earlier. Steve Messner (near Northfield, Minnesota) and I were the only ones to observe this event. 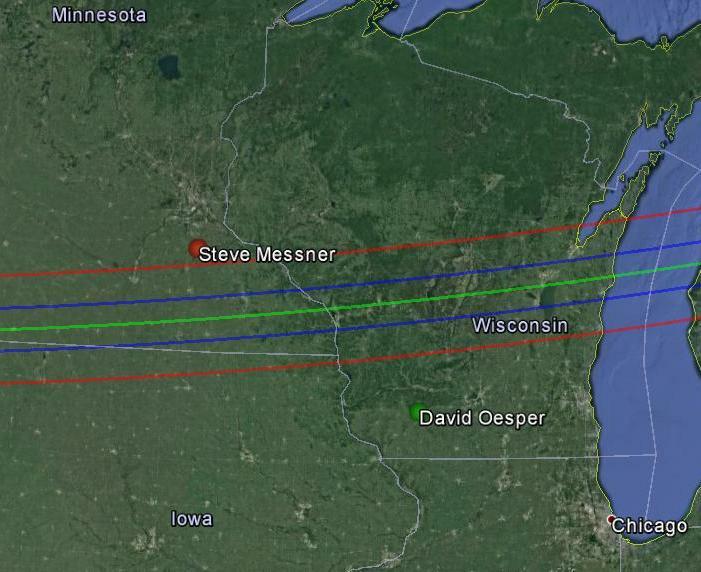 It was a miss for Steve, and he was much closer to the predicted path! Why do we do it? Even a single positive observation can greatly improve our knowledge of the orbit of the asteroid or trans-Neptunian object. More than one positive observation gives us valuable information about its size and shape. We can discover asteroid/TNO satellites and even rings! But that’s not all. These occultation events can also give us valuable information about the star. Its size, position, and the separation and position angle of new or known companion stars. Someday, we may even be able to use these events to discover exoplanets! If you love observational astronomy and would like to contribute scientifically valuable observations by observing occultation events, contact me and I will help you get started. The more observers we have, the more valuable our scientific contribution will be. Little did Shakespeare know that Ejnar Hertzsprung (1873-1967) would discover some 312 years later in 1911 that Polaris, the North Star, actually varies in brightness. Of course, Shakespeare was referring to Polaris’ proximity to the north celestial pole, but there are multiple ironies in that Polaris varies in brightness—albeit a tiny amount—and it will not always be the “pole star”, thanks to the precession of the Earth’s axis. Polaris is a classical Cepheid pulsating variable star, with a visual magnitude that has historically ranged as much as 1.9 – 2.1 over a period of about 4 days. At a distance between 426 and 439 ly, Polaris is the nearest and brightest Cepheid variable star in our night sky. Polaris is a supergiant star (F7Ib) weighing in at about 5.4 solar masses. Polaris and its nearest companion star (F6V, 1.3 solar masses) enjoy a complete orbital pas de deux every 30 years. Currently, Polaris lies only 40 arcminutes from the north celestial pole (declination +89° 20′). As with all stars, the Earth’s rotation causes the stars to wheel around the celestial poles, although in the case of Polaris the angular speed is exceedingly slow, making it a great target for a telescope without a clock drive. Let’s figure out how fast glacial Polaris moves. It traverses a tiny circle around the north celestial pole every sidereal day (23h56m04s), so what is its angular speed? We need only divide the path length (the circumference of a circle of radius 40′) in arcseconds by the number of seconds in a sidereal day to get the angular speed in arcseconds per second of time. The circumference of a circle is 2πr, so plugging and chugging we get [(2)(3.141592654)(40*60)] / 86164 = 0.18 arcsecond per second of time. Sound like a lot, or a little? This angular speed means that Polaris moves an arcsecond every 5.7 seconds, or 11 arcseconds every minute, or 11 arcminutes every hour. That’s just 4.2° per day. Not quite a perfect pole star, but it will certainly deux. After nearly 20 years of putting together a weekly sky/space/history events calendar, I am calling it quits. Why? It takes a huge amount of my time, and keeps me from doing a lot of other things. Even though I believe it to be the most comprehensive astronomy calendar in existence, I am 60 years old now, what I do for a living is more demanding of my time and energy than ever before, and I want to do more reading, more writing, more getting involved in the community. Life is short and you start thinking about all the things left to do when you hit the big 6-0. Besides, I’m not sure that many people use the calendar on a regular basis. For one thing, many of the event times are for a specific location. Dodgeville is a small town with very few people interested in astronomy (ironic, isn’t it?). These factors alone would discourage a wide readership. Such a location-specific calendar would make more sense in an astronomy-oriented community such as Mirador Astronomy Village which I would love to help develop but will never have the resources to start. One thing that will not change is the article portion of my weekly column. These will now be separate journal entries, and I will have the flexibility to post as often as time allows rather than on a rigid once-a-week schedule. I expect that the quality of these postings will actually improve since I will be able to devote more time to them. And you, the reader, will have the opportunity to comment, question, and contribute additional information. That is a good thing! Finally, in the past, I dropped my articles off the web after seven weeks. I’d like to think that some of what I write is worth keeping around longer than that.